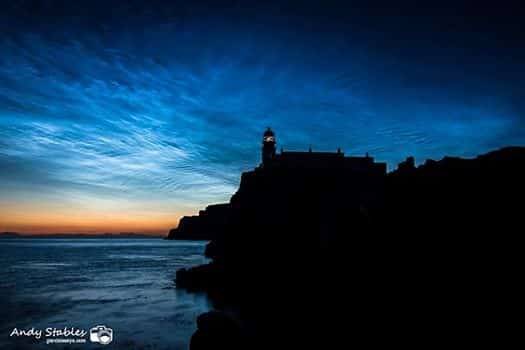 Noctilucent clouds (NLC’s) are the highest clouds in Earth’s atmosphere and are visible in a deep twilight, mostly observed in the summer months at latitudes between 50º and 70º north and south of the equator. They are made of crystals of water ice. They can only be seen when the sun is below the horizon. From Andy Stables of Glendale Skye Aurora’s: “On Skye, they can only be seen during June and July. They are not present every night. One recent night was clear but there were no NLCs. I usually see them only less than six nights per year on Skye. You need to wait until the darkest part of the night here to view them, so between 1am and 2am BST. Towards the beginning of June or end of July you can see them as early as midnight but you need to wait till 1:30 BST to absolutely rule out their presence.